WASHINGTON (CNN) -- Barack Obama is not a Muslim, and John McCain did not tell the television show "60 Minutes" he was a war criminal who intentionally bombed women and children in Vietnam. 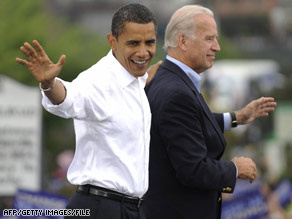 The Democratic presidential campaign of Barack Obama and Joe Biden has dealt with several Internet rumors. Joe Biden is not planning to step aside in favor of Hillary Clinton as vice president, and Sarah Palin did not order books banned from the library when she was mayor of Wasilla, Alaska. And they are all false. Heard that Obama was really born in Kenya and thus not eligible to be president? Wrong. Heard that Palin was a member of the Alaska Independence Party? Nope, she wasn't. But these stories are potentially damaging to the presidential campaigns of Obama and McCain, Washington communications expert Ron Bonjean warned, so it is critical to rebut them as firmly as possible. "Fighting rumors on the Internet takes hypervigilance and a lot of caffeine. Left unchecked, these rumors can get out of control, because perception is fact," he said. Obama and Palin are the subject of the largest number of e-mails, said Rich Buhler, founder of the fact-checking Web site, truthorfiction.com. "The last two election cycles, there have been rumors about each of the candidates, but there has been nothing like this election," said Buhler, who has been running his nonpartisan site for 10 years. "The number of Obama e-rumors has been huge, the stuff claiming that he was a Muslim. There are probably 15 or 20 Obama e-rumors. They have circulated massively," he said. Buhler attributes the popularity of Obama e-mails to the fact that he is a "phenomenon." "He is new, he is a threat" to some people, Buhler said. "When McCain named Sarah Palin, she became a phenomenon, so there were immediately a number of rumors about her, and now it's the Obama-Palin hit parade." That's why both campaigns make pushback a priority. Obama's Web site has a section called "Fight the Smears," run by the campaign's rapid-response team. "Here's the general philosophy: vigilance, force, speed, and use the network we have created to spread the truth via every avenue," said Hari Sevugan, a spokesman for Obama's rapid-response effort. "The idea of having such a large network of supporters is that they can reach an even larger network of friends, family and colleagues, and get the truth out," he said. "If you look at 'Fight the Smears,' it also has an action center. It's not just facts -- it's making sure those facts get out," he explained. The campaign does not underestimate the damage unsubstantiated rumors can do, especially ones that come directly from friends or family. "These things take root if you let them sit too long," Sevugan cautioned. The Obama rumors have spurred action both for and against the Illinois senator -- including a suit filed in Pennsylvania arguing that he is not eligible to be president because he is not a "natural-born U.S. citizen," and a Web site at isobamamuslim.com that contains a single word: "No." Philip J. Berg illustrates how hard it is to quash rumors once they spread. The Philadelphia-area lawyer, who filed the suit against Obama's candidacy, is aware that the Web site FactCheck.org has examined Obama's Hawaii birth certificate and ruled it kosher. But he doesn't believe it. "FactCheck.org is owned by Annenberg of Chicago, where Obama sat on the board," the lawyer said, dismissing the Web site's verdict. FactCheck.org describes itself as a "nonpartisan, nonprofit 'consumer advocate' for voters." It is a project of the Annenberg Public Policy Center at the University of Pennsylvania. And then there are the rumors that simply cannot be proven or disproved. One e-mail suggests that McCain behaved obnoxiously at a resort in Fiji before his last run for the presidency in 2000. The University of California-Santa Cruz professor whose name is attached to some versions of the story denies writing it but says she did forward it after a friend sent it to her. Truthorfiction.com describes it as "unproven," saying research has turned up no evidence to support it. "So far, we haven't been able to find any substantive information about whether it ever happened and, if so, with whom. We've asked McCain's campaign whether he's ever been to Turtle Island, but they haven't responded," Buhler said. "There are many e-rumors that are not able to be proven either because the e-rumor does not contain the kinds of facts that can be followed up -- such as name or location -- or because the information in it doesn't pan out," he added. The McCain campaign does its best to push back against falsehoods about the Arizona Republican senator and his running mate, spokesman Michael Goldfarb said. "We have set up a Web site, as Gov. Palin has been the victim of a lot of these smears," said Goldfarb, one of the main authors of the campaign's McCain Report blog. But he said there was only so much a campaign could do to rebut false stories. "We fight back, but there is a certain segment of the population that is never going to believe that Obama is a Christian, just as there is a certain segment of the population that is never going to believe that Trig Palin is Gov. Palin's son," he lamented. But his frustration is not primarily with Internet rumors. "Unfortunately, a lot of the smears against Gov. Palin have been echoed by mainstream media outlets," Goldbfarb said. He cited a September 2 New York Times article saying Palin had been a member of the Alaska Independence Party. The newspaper retracted the story the following day, blaming an AIP official's error. "It's damaging when it appears on the front page of the New York Times," Goldfarb said. But Washington public-relations expert Bonjean, for his part, recommended that campaigns try to use the media to help rebut smears. "The best way to fight Internet rumors is to go straight to the news media and try to get a story published saying 'this is not true,'" he said. "For any site that is promoting this rumor, you want to counter-attack it with the facts." If the rumor appears on a blog, he said, "flood it with comments from your team, or activate grassroots support. Ask your friends and campaign allies to do it." Buhler of truthorfiction.com said there is no way to know where most Internet rumors originate. "Most of these things, you'll never know how they started. They're brush fires," he said. Bonjean, a former spokesman for House and Senate Republican leaders, said some rumors probably came from "random crazy folks out there who want to perpetuate rumors for the thrill of it." But some, he suggested, did probably come from "rogue political operatives." He doubted they were working hand-in-glove with the campaigns, though. "I would find it highly unlikely they would be taking orders from the campaigns, because if it ever got traced back to headquarters, there would be a lot of trouble."